Situated in the Irvine Spectrum Center, near the Ferris wheel, Grand Cafe offers a 12-seat, pink-accented space dotted with Hello Kitty art created just for this concept. 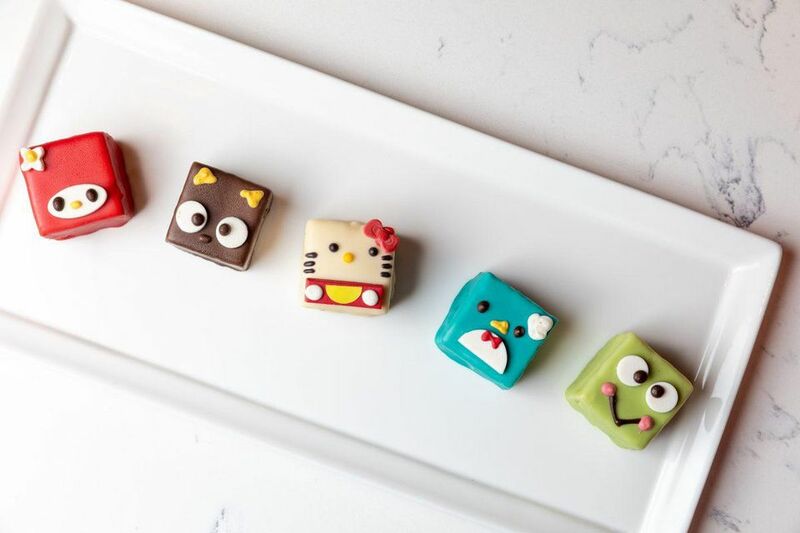 The “first and only permanent café in the U.S. featuring dual experiential spaces — a fast casual café setting open to the public and a separate private room for reservation-only afternoon tea program and cocktail service.” It’s here you can snag a few Hello Kitty Cafe staples—such as the cookie “pocket pies,” shaped like the brand’s eponymous cat and littered with sprinkles—in addition to a few new, exclusive items. The opening, as you would expect for an Insta-worthy eatery inspired by a beloved pop culture icon, was well-received. “We are thrilled with the fan response and happy to see so many enjoying the experience,” David Marchi, vice president of brand management and marketing at Sanrio, told me. Long, steady lines have been a constant since the Hello Kitty Grand Cafe’s September 14 opening and reservations for afternoon tea and cocktail service (28 seats) have been completely booked 30 days out, and as new slots open up at midnight they are quickly snatched up by fans. “Our goal is to offer delicious and supercute menu items in fun, unique environments for fans to experience and share with family and friends,” said Marchi. 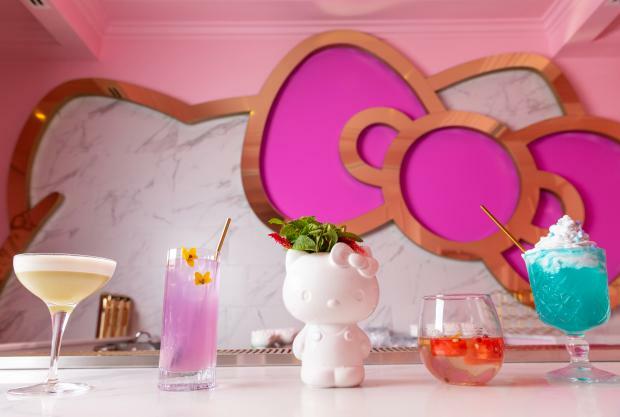 The Bow Room at Hello Kitty Grand Cafe splits its concepts by day and night, but both require some advance notice. 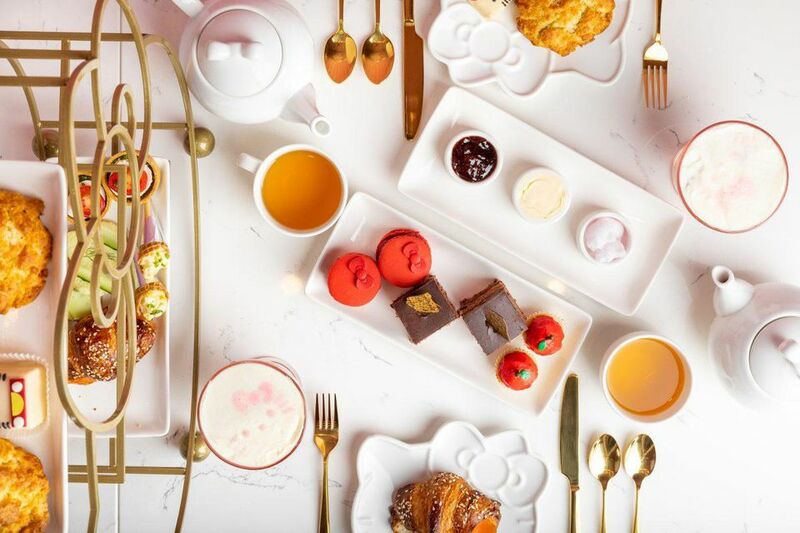 During the day—from Wednesday to Sunday—the space hosts afternoon tea service, where the $55-per-person tea extravaganza includes Hello Kitty-shaped tiers of fresh fruit, finger sandwiches and teacakes, and 15 specialty teas to choose from. There are buttermilk scones, raspberry macarons, cucumber and dill cream cheese sandwiches on milk bread, smoked salmon on pretzel croissants, pesto tarts and more, and you can sip through the selection with bow-topped teapots of masala chai, lychee peach, jasmine, Japanese cherry or organic fair-trade Egyptian chamomile tea, among others. 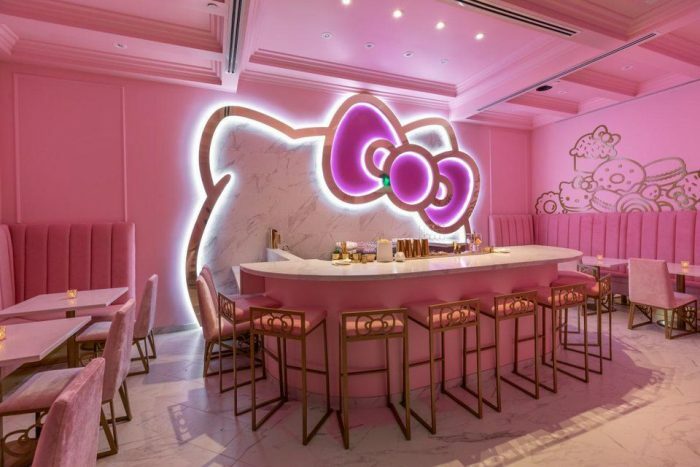 In the evenings, also from Wednesday to Sunday, the lights dim and the all-pink space flips to an intimate 21+ bar that’s illuminated by an enormous marble likeness of Hello Kitty. 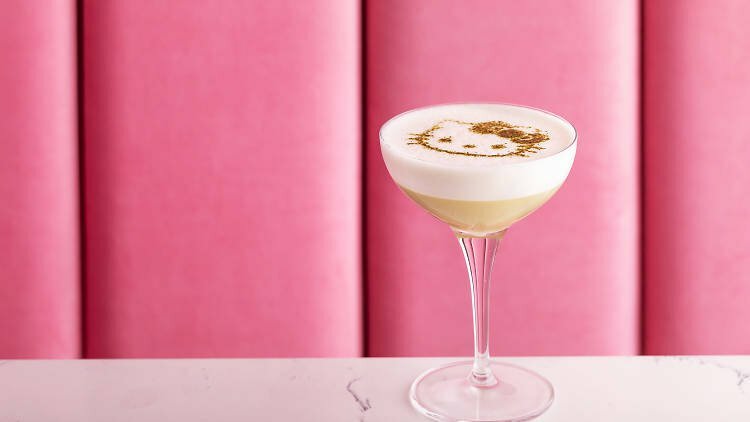 The craft cocktails, inspired by none other than Hello Kitty herself, in the Bow Room, a private pink paradise hidden behind the main café. Matcha Matcha (Japanese whiskey with yogurt, matcha and yuzu). 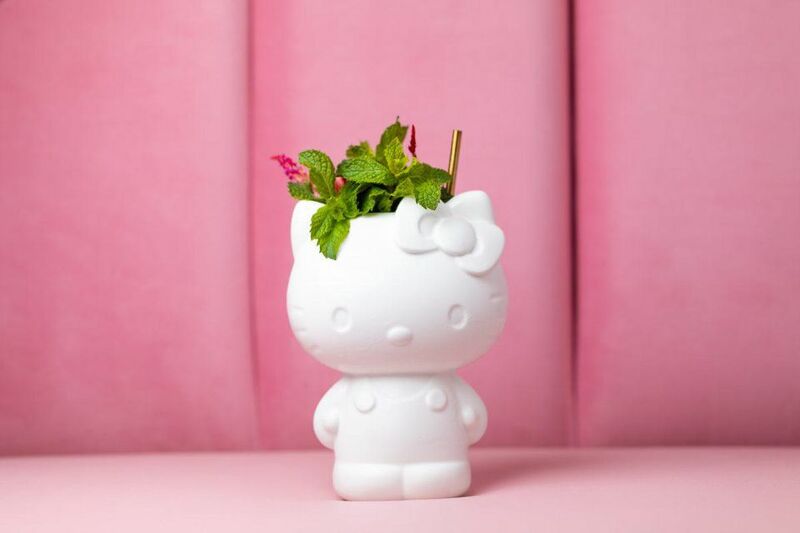 Although cocktail service runs only on Wednesdays, Thursdays and Sundays from 5 to 9 p.m., with extended hours on Fridays and Saturdays, the Hello Kitty Grand Cafe also offers an arrangement of wines served throughout the day and night, including its own assortment of official Hello Kitty wines and prosecco. 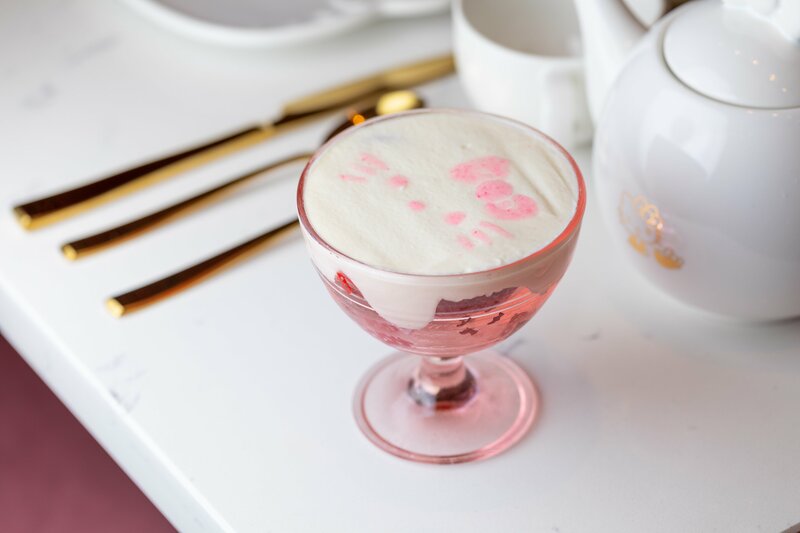 For special events, you can make a reservation at the Bow Room, a “reservations-only pink oasis with sleek Hello Kitty-branded fixtures.” It features tea service during the day, which includes yummy salads, fruit, croissants, and more, and turns into a 21+ cocktail bar at night. 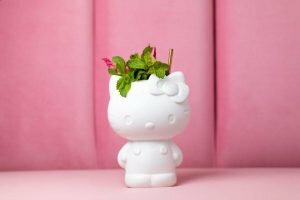 Basically, it’s the ideal spot for Hello Kitty fans both young and old, and a cute way to make your coffee run feel extra special.